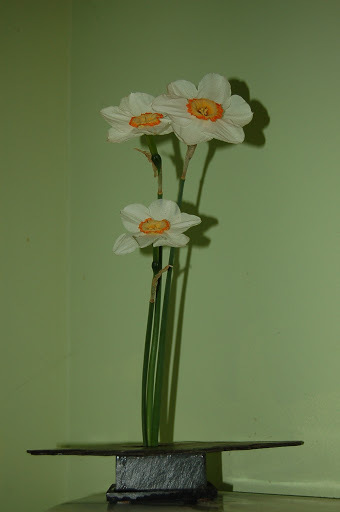 One of my joys in spring is to drag out my Ikebana vases and pop in the first blooms. The simplicity of the arrangement and graceful lines, are enough to fill my senses until the garden becomes an overgrown riot of color in a few months. I am no expert in the art of Ikebana. Many years ago for Mother’s Day I received the slate vase and have added to my meager collection since. Truth be told, if you have a “flower frog” you can make just about anything into an Ikebana vessel. A shallow dish or bowl will work, or use your imagination and try an old shoe! Anything that will hold water. I try to stick to two or three flowering elements, depending on the size and height. The basic principle is to focus on areas of the plant such as the stems, as well as the blooms, with an eye toward creating a shape, line or form that is pleasing. Minimalism is the key here. 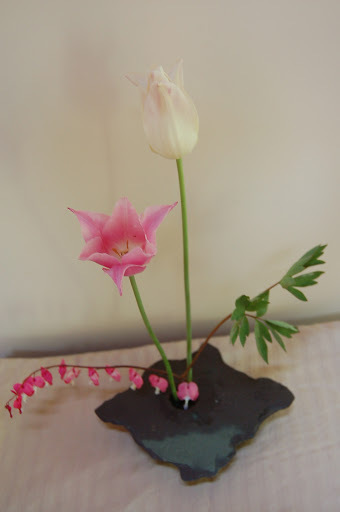 In traditional Japanese Ikebana, the arrangement is based on a scalene triangle, (a triangle that has three unequal sides) of which the container is a key element. That’s a little technical for my skill level and inventory. Historically, the art is attributed to a Buddhist priest approximately 500 years ago. There are many local clubs and associations as well as national and international organizations such as the Ikebana International which was founded in 1956. This entry was posted in Uncategorized. Tagged flower frogs, Ikebana, Japanese flower arranging.